Utagawa Kuniyoshi (1797-1861) Pictorial Mirror Stands Matched with Thirty Selected Flowers: Akitsushima, 1845. Oban. This brilliant print is a mitate… a print that is also a puzzle. These sorts of print were designed to get around the censorship laws called the tenpo reforms that prevailed in Edo in the 1840’s. It’s quite rare, a Kuniyoshi actor print from a relatively unknown series of which only 16 are known. A copy exists in the MFA Boston, but they do not identify the actor. 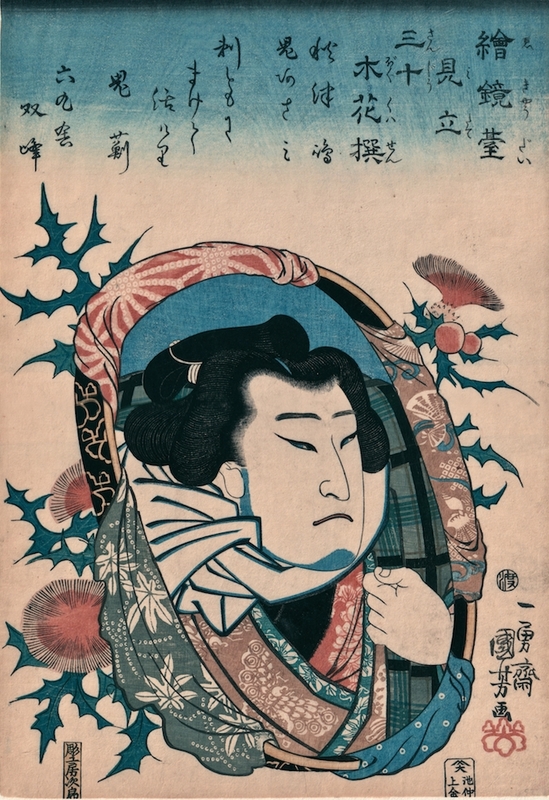 The print shows an actor, Kataoka Nizaemon VIII, in the role of Akitsushima Kuniemon, a top sumo wrestler known as a sekitori who performs in one of the two highest professional divisions, from the play Sekitori Nidai no Shobuzuke. The actor is presumably backstage… a popular and thrilling thought for the kabuki fan, regarding himself in a mirror. These mirrors were popular in Edo Japan with women and actors. The polished metal (not glass) is framed with padded, decorative material. Surrounding this material are the blooms of Azami a Japanese thistle, recalling one of the all time bad guys of kabuki, Seikichi, sometimes known as oni-azami or Demon Thistle. The play, Sekitori Nidai no Shobuzuke is a piece of moral dilemma: Akitsushima Kuniemon is obliged to throw a sumo bout in order to rescue his partner from prostitution. A familiar kabuki tale! A very nice Kuniyoshi, an unusual series and a pleasing mitate. The print is overall in excellent condition, some slight trimming to the lower margin. Colour and impression very fresh. The print is also in the MFA collection, Boston.